Tom Kessel shows off one of his binders of photos that he has taken over the past 40 years. Forty years of documenting Fairfield County through photography and interviews has left a Darien man with a collection to rival any museum. Tom Kessel has been traveling around Darien, New Canaan, Greenwich, Stamford and Norwalk for the past 40 years taking pictures of roads, bridges and buildings all in an effort to document how the area has changed over the years. "I'm up to 18,00 pictures now and my only pleasure now is taking photos and writing histories," Kessel said. "I've done hundreds of interviews and I'm now 60 years old and you look back at what you've compiled and it's hard to believe." Kessel's passion for photography was born from his love of old films and after writing letters to some of his favorite actors, Kessel had accumulated a collection of 7,000 movies and more than 1,000 autographs. "I love old films and since 1964, I've met a number of famous people and collected over 700 movie books and 500 movie magazines," Kessel said. "I'm so proud of what I have but when I first started taking photos and sending letters I used to get a lot of dirty looks. I don't want people to think I'm weird." Despite his extensive collection of photos and interviews detailing how Darien and other towns have changed, Kessel has struggled to find a place where his work can be appreciated. "About a year ago I went on Facebook and started posting my photos," he said. "When they started tearing down Stamford 40 years ago, I have pictures of what the town used to look like and people are now happy to see my photos." Kessel was born in Germany but was later adopted and raised on Camp Avenue in Darien. As he compiled histories of the town, he became more interested in his own heritage and spent years trying to track down his biological parents. "It took me 16 years to find my parents. I was adopted and raised on Camp Avenue and that's where I grew up," Kessel said. Despite the effort it took to locate his parents, the search motivated Kessel to continue documenting the area. "One day in 1967 or 1968 I wanted to take pictures of Darien, but I found myself traveling all over the five towns taking photos. With the onset of urban renewal, houses were coming down and I wanted to document it," he said. However, traveling around taking photos was no easy feat for Kessel, who didn't get his driver's license until he was 30. He would walk from his house on Camp Avenue to Stamford where he would ride a bus around the area and often into New York. "Once I got a license it was much easier to get around to take photos," he said, patting his legs. 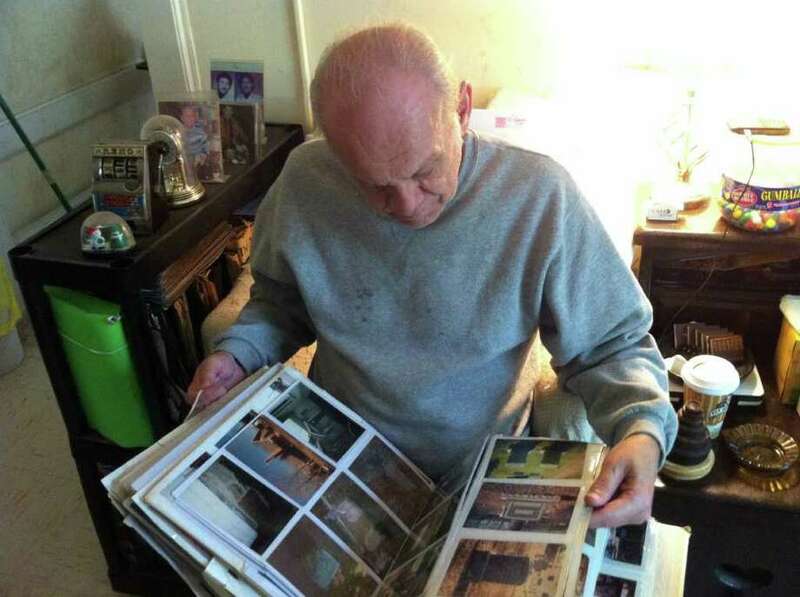 "The bus would only take me so far and I often walked from Stamford to Port Chester, N.Y."
Because he has spent so much time documenting his travels around Fairfield County, Kessel said he would like to find a home for his collection. Despite appeals to historical societies and museums, Kessel has been repeatedly turned down. "I went to the Smithsonian 15 years ago and they told me they didn't know what to do with my collection. I have all this history and I can't find anyone to promote it." Included with the volumes of typewritten interviews and thousands of photos is a massive collection of newspaper clippings. The collection even predates Kessel's desire to collect, as he inherited a large portion of the clippings from his grandparents. "My grandparents started a newspaper collection of Darien and Stamford, and after they died I continued the collection. They would save everything," Kessel said as he thumbed through a binder held together with a rubber band. "I've tried to keep it as neat as I can." As he continues to search for a home for his collection, Kessel said he will keep taking pictures. "I love history and this has been a labor of love."